The second day will focus on in-depth modeling and practicing of the principles explored on the first day. Inspired by his over 15 years working with the trauma-informed care paradigm which resulted in his recent books, Matt Bennett is excited to partner with The Network to present Connecting Paradigms: Positioning Trauma-Informed Care, Motivational Interviewing & other Best Practices for Client Outcomes. Harm reduction, Motivational Interviewing (MI), trauma-informed care, and other best practices provide tools and approaches that assist us in helping those we serve. While these paradigms increased capacity to meet the ever-changing needs of clients, less attention has been paid to bringing these together in a coherent model designed to improve quality and client outcomes. This training provides an innovative approach to helping those struggling with past trauma to make critical life changes, manage their service delivery, and heal from trauma. Connecting Paradigms presents an integrated model, combining research in neurobiology, trauma, behavioral change, harm reduction, and Motivational Interviewing into a practical skill-set easily implemented across a variety of settings and professional backgrounds. This workshop introduces the core concepts presented in the books in a practical way that allows for immediate implementation. A quick-paced and dynamic training, participants learn MI skills in the context of trauma-informed care, harm reduction, and the Spirit of MI. Many of our clients face critical changes if they are to reach the health outcomes we hope for them. The training gives providers the approaches needed to maximize their time and work with clients. Attendees can register for either the first day or both days. The first provides a solid understanding of the principles upon which Connecting Paradigms is based. The second day offers in-depth modeling and practice of these principles. Understand how trauma, neurobiology, and epigenetics inform interventions and communications. Apply the Connecting Paradigms model for client interventions and program development. Utilize harm reduction, stages of change, mindfulness, Motivational Interviewing, and other best practices together to improve outcomes. Conceptualize what developments in neurobiology and epigenetics tell us about healing from trauma and behavioral change. 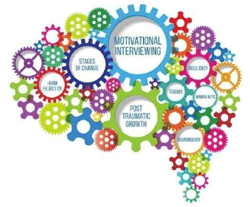 Develop skills to integrate trauma-informed Motivational Interviewing into your work with clients. Matt Bennett, MBA, MA, has a master’s degree in community psychology and executive development (nonprofit management), as well as a master’s in business administration in health care. Mr. Bennett has successfully combined his academic pursuits as a researcher, blogger, podcaster on the Trauma-Informed Lens Podcast, and published author with his practical experience in leading nonprofit organizations and educational institutions to develop research-based solutions to improve the health of individuals, organizations, and systems. As a sought-after trainer, Mr. Bennett utilizes a participant-centered approach, which includes interactions and adult learning activities to maximize learning, retention, and application. Mr. Bennett’s presentations are a dynamic dance of innovative research, practical applications, and a passion for the art and science of helping others.